French food and drink company Danone has announced it will cut 900 jobs after weakness in southern European economies hit sales. The owner of Activia yogurt and Evian bottled water reported sales of 20.1 billion euros ($26.8 billion) in 2012, up 5.4% from a year earlier. But sales in Europe fell 3% following a “severe deterioration” in consumer demand. As a result, Danone has announced a cost-cutting plan. The firm plans to cut about 900 management and administrative positions across 26 European countries. “2013 will be a year of transition, with vigorous development in business in our growth markets and a drive to strengthen operations in Europe,” said chairman and chief executive Franck Riboud in a statement. 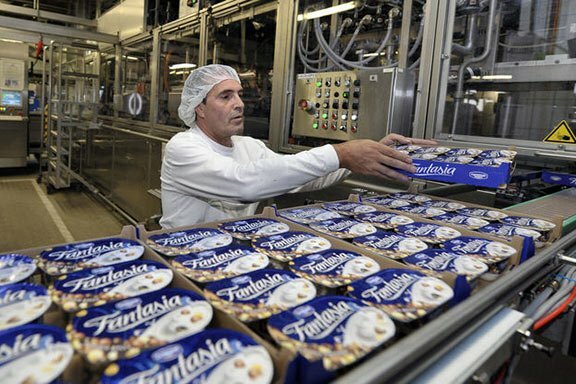 The world’s biggest maker of yogurts predicted its profit margins would fall again this year, with a negative trend for demand in Europe and prices of raw materials staying high. Its sales growth in 2012 was at the lower end of its own expectations and behind the 5.9% achieved by its Swiss rival Nestle. Danone is heavily exposed to European economies, with about 38% of its sales coming from Western Europe. Sales at its Spanish dairy division were particularly weak. Danone announced in December that it was preparing a two-year cost-cutting programme to save about 200 million euros.